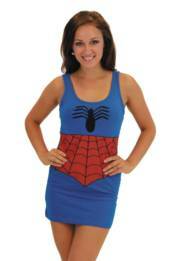 Marvel Comics created The Amazing Spider Man's suit in 1963 and now we have taken this fashion to Marvel Tank Dresses. This officially licensed, juniors fit tank dress is stretchable and extra soft. GOLDEN AGE MARVEL COMICS VOL.3 (MARVEL MYSTERY #9-12) VAR. ED. GOLDEN AGE MYSTIC COMICS VOL.1 (#1-4) VARIANT ED. SPIDER-MAN MARVEL PEN TOPPER POP!